Ask any commercial building owner and they’ll tell you that the costs of maintenance are probably close to burying them. It costs a lot to maintain the interior or exterior of any building, but between roofing and asphalt resurfacing, it could impact more than just your pocket. If you don’t prepare in advance, it could be a huge inconvenience for everyone. Here are five of the major pitfalls of resurfacing and how you can avoid them. Every location has its own particularities when it comes to how the ground above it shifts and erodes. While there have been some great leaps and bounds in architectural engineering and our understanding of structural integrity, spaces change unexpectedly. If the surface that you’re dealing with is located near a construction site or near a waterway, there could be a significant change. Areas with seismic activity, whether manmade or natural, are going to have serious asphalt issues all of the time. Make sure that the conditions of the soil underneath your asphalt are going to be stable for a while. If you can’t change the issue, you can still account for problems by adding more material or reshaping your asphalt to stay away from those regions. While it’s a pain in the neck to have to reshape your whole project or even your whole commercial parking area, it’s worth avoiding repeated trouble you can’t fix. If you’re going to repave your entire parking area and you rely on that for revenue, you need to make sure that you keep it open as long as possible. If you don’t have an alternative space, make a plan before you resurface your area. Even if it’s just a lot for workers at your commercial building to park, it’s could impact revenue that your tenants make. Work with a nearby commercial building to exchange parking needs. Eventually, every lot needs to be resurfaced so make an agreement, in writing or verbal, that you’ll allow their employees to park in your lot and vice versa. This can save everyone a lot of hassle and keep things going smoothly if the two locations are close enough together. If you’re running a lot where you’ll be selling parking access for special events, choose your timing carefully. Coordinate with the company who is doing the resurfacing to fit in when there’s an offseason or there’s a dip in attendance. For a lot that’s meant for a business, you could work with your tenants on a solution. Consider helping to fund the system or software they need to allow their staff to work from home. Hire a shuttle to come twice daily from a commuter rail to the building and back so that people can get to and from work easily. The asphalt that you choose is going to determine how often you need to clean it and how you maintain it. Porous versus non-porous asphalt have their own needs when it comes to how you clean and whether or not you use certain cleaners. If you use a pressure washer to clean up your asphalt, you could damage it, causing you to resurface it sooner than planned. If you use the wrong kind of detergent, you might also cause the asphalt to break down and deteriorate. While most outdoor paving can handle pressure cleaning an pressure washing make sure that your asphalt isn’t going to be ruined by it. Using the wrong technique on asphalt or glassphalt could be destructive. You need extra care to protect it, but insufficient cleaning can also be destructive. Make sure you’re choosing a resurfacing material that you can keep up with. Whatever you choose, debris, waste, and contaminants must be managed to protect the surface. When you’re going to have your asphalt resurfaced, make sure you do your research on the contractor who you hire. There are lots of great contractors out there but also some who are a little bit subpar. Look for reviews online to find out what other people have said about that contractor in the past. Find one who has the equipment and has a specialty on the kind of surface that you’re dealing with. There are a lot of fly-by-night contractors out there who want to get your business but will take forever and then do a less-than-stellar job. Look out for any contractor who is going to cut corners on you. If they’re doing a resurfacing, they should have a plan in order for you to follow and use high-quality materials on the final surface. Also, your contractor what they’ll do to improve the old base before they resurface. The contractor you hire should have at least a 1-ton roller to finish the surface and smooth it out at the end. While some people choose to patch and patch their lot when they see a pothole or an issue, patching can’t solve underlying issues. After a while, patches wear down unevenly and can even damage vehicles that drive over the lot. If you’re going to resurface, don’t bother trying to patch everything up as that’ll be a waste of money. The issues underlying your constant patching or need to resurface must be dealt with as comprehensively as possible before you resurface. A professional company can take the time to help you understand problems with your lot so you make the right decision on treatment and materials. When you’re choosing an asphalt resurfacing partner, you need someone who you can trust. It’s important that they put your business’s interests in front of their own when it comes to scheduling, materials, and methodology. If you want to know what to look for in a parking lot resurfacer, check out our guide. 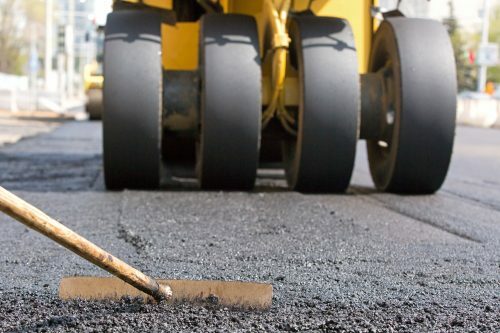 Sooner or later, your commercial asphalt will require repairs. There are preventive actions you can take, but eventually, an asphalt driveway or parking lot will require some extra care. When this time comes, you want to make sure you hire a great asphalt paving company in your area. Here are some actions to take to learn more about any given company. An easy way to learn about the quality of a certain business is to ask whether the asphalt is custom-made. You only want the highest-quality ingredients to be used around your property. Unfortunately, many companies use prepackaged materials in their asphalt mix. You want a mix that only contains fresh, raw materials or else your structure will not last as long as you would like. Additionally, when trying to hire a great asphalt paving company you want to ask questions about drainage. This is an essential quality of any asphalt parking lot because water pooling on the surface can lead to premature damage. In fact, a great paving company will bring it up independently. Experienced pavers understand the importance of good drainage. If you talk to a team that has no idea what drainage is supposed to be, then you need to look elsewhere. A company confident in its abilities will have no problem allowing you to watch the preparation process. Good preparation is vital in ensuring longer-lasting pavement. You can also use this opportunity to find references for other property owners who have hired this company before. A company’s reputation is everything, so when previous customers speak negatively, you should take it as a clear warning sign. When it comes to the quality of your property’s pavement, do not leave anything to chance. Luckily, you know you will always receive exceptional work when you get work done by NVM Paving & Concrete. Contact us today at 703-426-2700 to alleviate any fears or concerns. When it comes to laying a commercial or multi-family parking lot, longevity matters. If the material doesn’t last, you’ll have to repave it and no one wants to waste their money on a poorly done job. There is a reason why we choose asphalt for roads and parking lots. Asphalt lasts. It is sustainable, long lasting and durable. When you think of sustainable materials, you might not initially think about asphalt. The truth is pavement is a heavily recycled material. When contractors redo a road or parking lot, the asphalt doesn’t have to be thrown out. They can reuse it. This makes it one of the more sustainable materials and shows how asphalt lasts. Asphalt lasts. 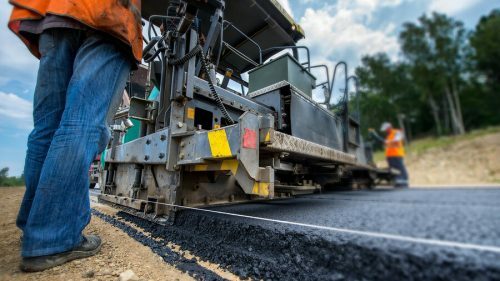 You do have to resurface the distressed upper layer of asphalt, but usually, you don’t have to do this for about 15 to 20 years. On average, you won’t have to refinish your parking lot for 13 years. This is incredibly cost-effective, knowing that it’s easy to maintain and you don’t have to worry about expensive replacements in the near future. If the longevity isn’t enough, the pavement is durable. If it stands the tests of roadways, it handles parking. You want something that isn’t going to easily become damaged or grooved with weather or use. The point of a high-quality parking lot is for it to last and asphalt is one of the best materials for a lasting driveway. When you have a commercial property, you need the parking lot to look good. This is the same when you rent out a multi-family property. The driveway is going to see a lot of traffic and it needs to appeal to tenants and customers. Asphalt happens to be one of the more eco-friendly, long lasting materials when it comes to building driveways. Do you have a paving need at one of your properties? Contact NVM Paving & Concrete today by calling (703) 372-9335 or sending an email to [email protected] to get a free estimate for your next project. Pavement maintenance is important to any business or property. Every space should be welcoming and inviting to committed guests or potential customers. To maintain your pavement properly, you need to have a pavement maintenance plan in place. Before constructing the plan, though, you must be careful to avoid four major pitfalls. 1. General Plan: The first problem that you could encounter is using a plan originally made for a different area. Your pavement is unique. The plan you choose should reflect the pavement you seek to maintain. 2. Outdated Plan: Similarly, plans created over ten years ago should no longer be used. A lot of things change in a decade, and your pavement maintenance plan should too. 3. Inaccurate Estimations: Often, managers do not correctly predict the budget necessary to enact the pavement maintenance plan. When money is short, people cut corners and do not carry through with the needed upkeep. 4. Novice Assistance: Lastly, avoid choosing helpers that are not of expert quality. Inexperienced workers may not correctly assess your property or determine what needs to be done, costing you more time and money. To construct the strategy that you will use to successfully maintain your pavement, you need to follow four easy steps. 1. Hire a professional. You must first find expert help. Specialists ensure that you cover everything that needs to be taken care of. 2. Inspect the property. The professional will walk the property with you to assess the age and condition of the pavement, checking for cracks, drainage issues, raveling, tripping hazards, and more. 3. Record findings. Next, you and the expert will note your discoveries and chart the condition of each area of the paved surface. 4. Address items in your plan. Lastly, the professional will sit down with you to create a maintenance plan that addresses issues found and preventative measures needed to avoid future problems. Successfully maintain your pavement by contacting NVM Paving and Concrete, by calling (703) 372-9335 or sending an email to [email protected] to get a free estimate for your next project.